Multipurpose: Used as a warm night lamp for mothers who need to feed baby at night; used as photography props to make your pictures more special; Portable and rechargeable design, as an essential light for camping. 3 Colors Changing: The lamp&apos;s color can be changed by touching, with warm white, cool white and warm yellow, natural light, no harm to your eyes, very safe and practical. Environment Friendly: Made of PVC material, adopt advanced injection molding technology, LED light, low power, power saving, with long service life. Strong Battery: With built-in 240mAh battery, can be used continuously for 3 to 6 hours according to the different light colors. 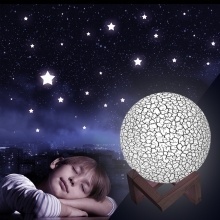 Brilliant Gift: As a perfect technology gift for kids and friends and family on Christmas, Valentine&apos;s day, birthday and wedding, a creative decorative light for home and create a wonderful atmosphere beyond your expectation. Because of the light, the colors of the moon lamp will appear some reasonable chromatic aberration.